Today a phone is often more than just a device to send and receive calls. There are thousands, if not, millions of applications out there that can be loaded on the latest smartphones that allow us to do incredible things. Google's newest project, project Tango, aims to add a whole new level to the term "smartphone' and give phones "a human-scale understanding of space and motion". Project Tango turns a normal phone into an extraordinary device. 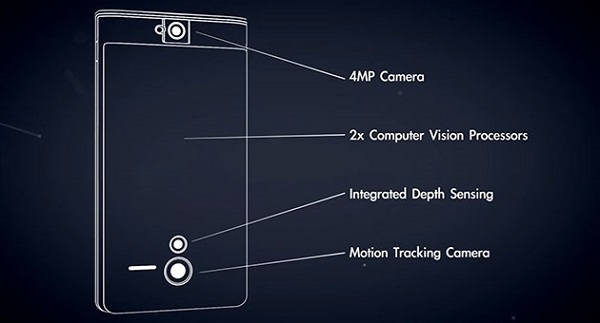 The current prototype is a phone equipped with two computer vision processors, an integrated depth sensor, and a motion tracking camera. Putting all of this together allows the phone to make 250,000 3D measurements every second. These measurements make the phone have full awareness of its position, and allow the phone to render the world around us. This new technology allows us to use our phones in ways we would never have imagined before. Virtual and augmented reality have been highly talked about in the gaming world. Project Tango could add to these technologies and have a huge impact on gaming. In Google's video showcasing the project, they show how one could scan any room or environment and use it in a game world. This would allow you to turn your house into a level you can interact with. Tango also allows the phone to have an accurate awareness of its position in space. This would allow the user to use their phone to control various objects in games, as well as place augmented objects in the world, via their cell phone screen. Project Tango obviously has more to offer than gaming. There are numerous purposes that have already been considered. One of which being able to scan your house then load in augmented furniture to try out new pieces of furniture without having to leave the house. This same concept could be applied to many things, such as deciding on a new hairdo, or deciding on your outfit. Another use of Tango could be an aid to those visually impaired. They could have their phone alert them of any dangers in the world around them, and guide them throughout their environment. Beyond what Google has previewed, there are numerous possible uses Tango could have, but only time can tell what possibilities there are with Tango. As of now it is unclear as to when exactly we will see project Tango in the hands of consumers. Google plans to have approximately 200 devices ready to send out to developers by March 14th. Unfortunately, this date is most likely far off from when we will see it ourselves. It should be noted that there hasn't been a list of planned devices. It appears as if Google wants to bring this technology to various mobile devices, not just phones. Despite this, I have a feeling that we could see this technology coming to project Ara, a project that aims to provide consumers with modular phones, considering that both Ara and Tango came from the Advanced Technology and Projects group.